Working with Co-Parents is a practical manual for therapists and social workers who work with divorced and/or separated parents of children. 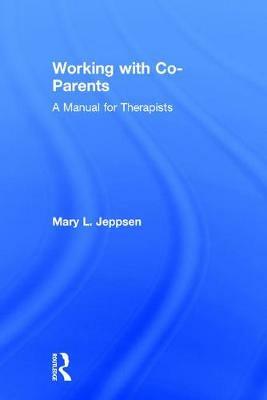 Unique among other books that focus on therapy with the parents individually, the author's model brings the divorced couple together to help them understand their child's experience and to assist them in developing a road to constructive co-parenting. This manual also includes illustrative case vignettes, session outlines and handouts, and homework reflection questions. Therapists and counselors will learn tools and interventions that they can apply immediately and effectively to their work with divorced couples. "Co-parenting well requires ex-spouses to, at least on occasion, be in the same room together and communicate. So, why doesn't therapy facilitate this? That's the question Dr. Jeppsen asks in her innovative attachment-based approach to therapy with co-parents. Even in an environment of hurt and distrust, her approach helps co-parents find common ground to better raise their children. In this book, therapists gain practical session outlines and guidance for in-session discussion topics and detailed clinical procedures for working with clients. What children gain is a Mom and a Dad. I highly recommend it." "Dr. Jeppsen's co-parenting program is an essential part of my work representing children in high conflict custody cases. These children need their parents to get better. Dr. Jeppsen's work has helped hundreds of children in Arkansas, but she is just one person. I am so thankful that the reach of Dr. Jeppson's co-parenting therapy model is expanding and that many more children will benefit from her work and vision."